Payment usually within 48 hours via bank transfer. FREE collection. Outstanding debts such as marina fees or marine mortgage cleared if necessary. We agree a net return figure for your boat, carry all the costs and try and make a profit on top. This is a sole agency agreement. Charges not incurred by you would be for example: collection, storage & continual valeting. Once sold funds are paid directly in to your bank account on completion of transfer of ownership/bill of sale. This system is ideal for boats up to £10,000 that can be trailered. We have limited space so please book in advance. We offer flexible brokerage rates depending on the value of the boat. This is a sole agency agreement. Please contact us to discuss. Free storage ashore applies subject to availability and whether your boat will fit on one of our trailers in order to be lifted on to chocks. Marina berths are available but subject to MDL berthing charge. 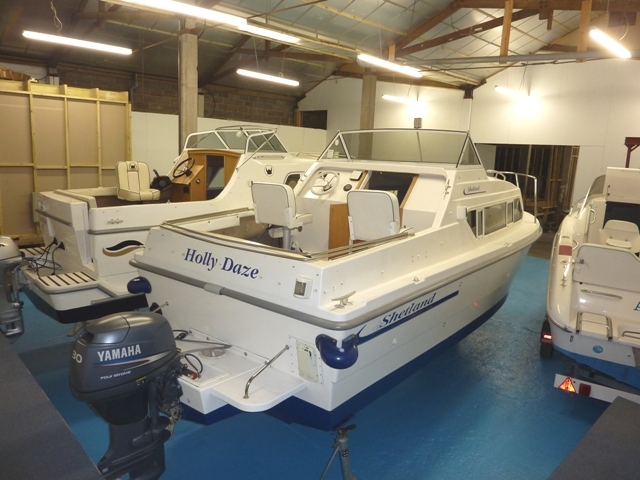 We have an indoor showroom available for selected smaller boats allowing your boat to stay dry whatever the weather! We do extensive advertising on the internet and in the press. Our on site valeter is continually cleaning making all our boats presentable at no charge to you. Part exchange is available on your boat where we will purchase the customers boat in order to pay you. Please contact us for advice on selling your boat anytime.